A newborn elk calf in northwest Oregon. 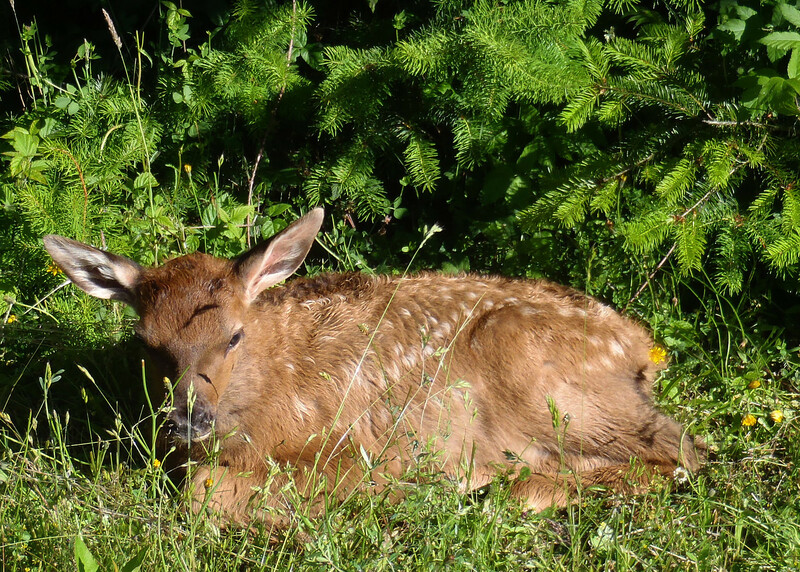 Remember not to interfere with deer fawns or elk calves by themselves. 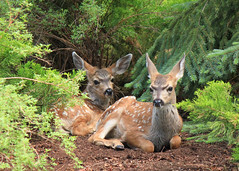 Mule deer fawns in Sunriver, Ore. Photo by Greg Yamada. 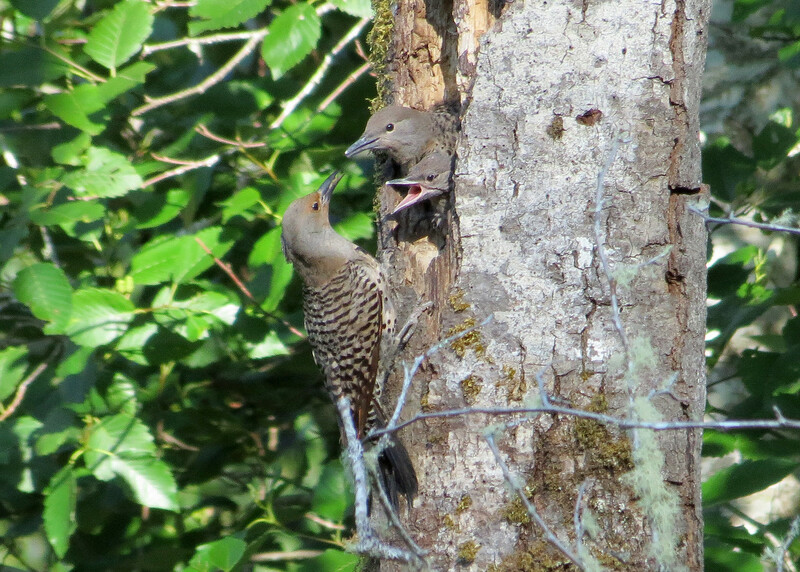 A female northern flicker feeds its young. Nestling birds can be returned to their nest but leave fledgling birds alone as they learn to fly and keep your pets indoors. Photo by Jo Leach. 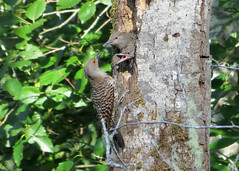 SALEM, Ore.—May and June are the months when newborn animals are getting their start in the wild. Help them out by giving them space and leaving them alone. ODFW and Oregon State Police remind Oregonians that taking young animals out of the wild isn’t just against the law—it’s also bad for the animal. These animals miss the chance to learn important survival skills from their parents like where to feed, what to eat, how to behave as part of a group and how to escape from predators. Unfortunately, every year about this time, ODFW offices across Oregon get calls from people concerned about “orphaned” deer fawns, elk calves, seal pups and other animals they find alone. But the mother animal is usually just off feeding not far away. She will return soon, so don’t interfere. 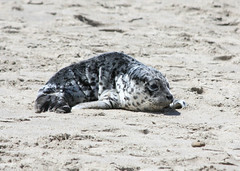 “People often pick up animals they find alone out of good intentions, without realizing they may be sentencing the animal to an early death by removing it from its natural environment and its parents,” said Julia Burco, ODFW Wildlife Veterinarian. If an animal is injured, or truly orphaned, it needs special care. Oregon’s licensed wildlife rehabilitators have the knowledge and facilities to provide this care. They use special methods that limit human interaction and mimic the animal’s natural lifestyle as much as possible, so the animal can hopefully be returned to the wild. Before picking up any wild animal, call ODFW, Oregon State Police, or a wildlife rehabilitator for advice. Removing or “capturing” an animal from the wild and keeping it in captivity without a permit is against state law (OAR 635-044-0015), as is transporting many animals. 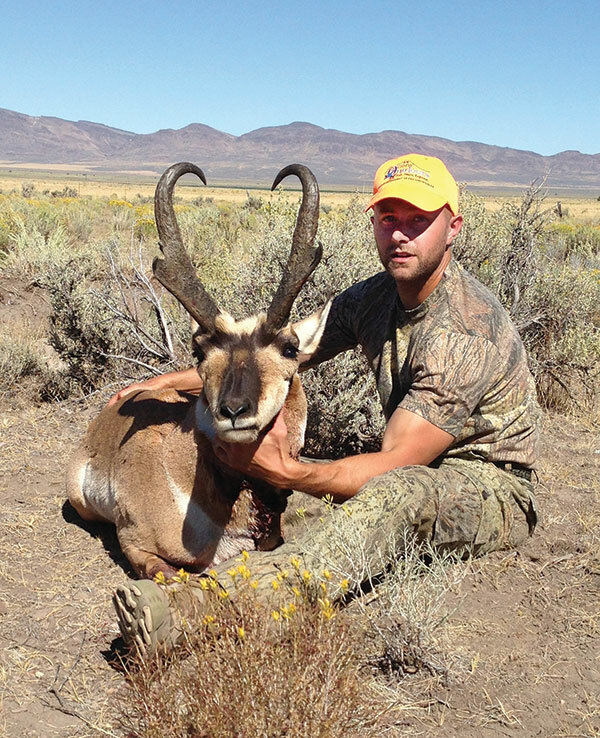 Last year, seven people were cited for such offenses (No wildlife holding permit/Take-hold young game mammal). Never assume an animal is orphaned. Don’t remove it from the forest, including your backyard. 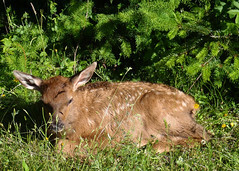 Female deer and elk and other mammals will often leave their young temporarily for safety reasons or to feed elsewhere. They will return when it is safe to do so (when people, dogs, or predators are not present). Call your local ODFW office, Oregon State Police office, or a local licensed wildlife rehabilitation center when: 1) you see an animal that you know is orphaned because you observed the dead parent animal, or 2) the parent hasn’t returned for several hours or even up to a day, or 3) if the animal is clearly inured or in distress. Bunnies are rarely orphaned; mother rabbits only visit den sites at dusk and dawn to feed her young. Keep your dog or cat away from young wildlife, especially in the spring. 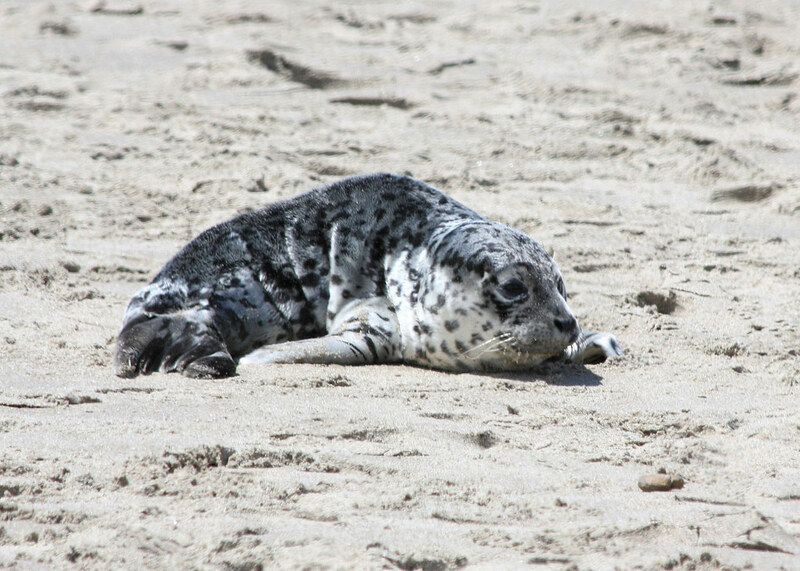 If you see a seal pup, young sea lion, or other marine mammal that appears stranded or in distress, contact OSP’s hotline at 1-800-452-7888. Leave fledgling birds alone. It is natural for fledgling (mostly feathered) birds to be awkward while learning how to fly. If you see one on the ground, leave it alone and keep your distance. Bring your pets under control and indoors if possible. The mother bird will feed it for several days on the ground until it “gets its wings. Return nestling birds to the nest. Nestlings (baby birds not fully feathered) found on the ground can be gently and quickly returned to the nest. If the nest is out of reach, place the bird on an elevated branch or fence, or in a nest made from a small box, out of the reach of children and pets. Leave the area so the parent birds can return. Bring your pets indoors. Cats are a major cause of injury and death for all birds, killing millions of birds in the US annually. Keep your pets away from fledgling birds learning to fly. Be careful when pruning trees as there may be a bird nest in the branch. Wait until birds are out of the nest. Beware of cavity nesters. Barn owls and other birds could be nesting in hollowed-out trees or logs and in haystacks. What if a bird flies into a window and appears hurt? Birds can be confused by reflective surfaces and mistakenly fly into windows. If you find a bird that has been stunned as a result of a window strike, put the bird in an uncovered box with a towel on the bottom. Keep it in a quiet place away from pets and check back in a couple of hours. If the bird has recovered, it will have flown off. If not, contact a local ODFW office or your local wildlife rehabilitator. Let turtles cross the road. In May and June, females begin searching for suitable nesting grounds to lay their eggs. If you see a turtle on the ground, the best thing to do is leave it alone and let it continue on its path. It’s fine to move it off a road (if it is safe for you to do so,) but put it on the other side, where it was headed.